He had certainly pulled off a broadcasting coup with the BBC’s very first live outdoor broadcast. But this was no mere technical triumph. For Reith, this was art coaxing Britain’s natural heritage into song, by no means an entertainment gimmick. Furthermore, this unusual idea was a good fit with his vision for public service broadcasting, then just two years old, as an instrument of well-being and cultural uplift, underpinned by British moral and ethical ideals. Striking to note here is that nature is granted permission to inhabit even the most sacred of silences with its reassuring rhythms and continuities. Many men writing in Flanders had found solace and comfort (as well as much sadness) in birds and their song. Diaries, letters and poems are full of observations about the joy of witnessing nature thrive or regenerate amid the mud and destruction. 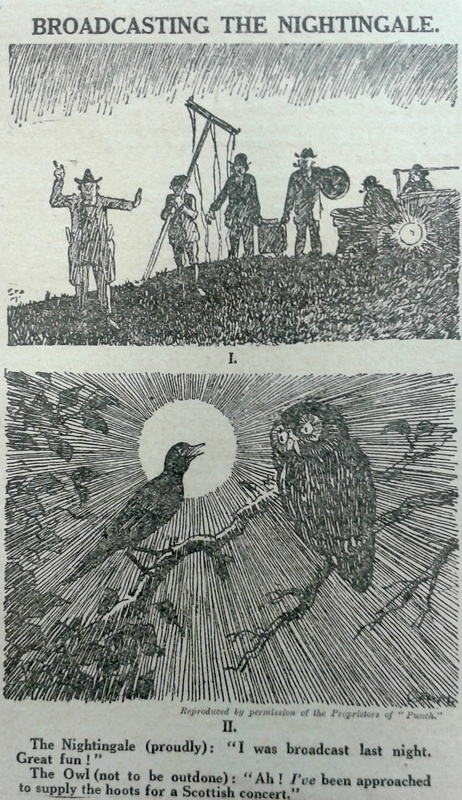 Throughout the war, the ornithological magazine British Birds published reports of bird news from the front line. So often, men found birds to be adaptable and resilient, if not indifferent, to the noise and devastation around them. Birds carried on. They sang through bombing raids . Such behavior, seems to have inspired soldiers to believe that in spite of the folly of world conflict, the natural world, of which they were still a part, was durable and eternal. Survival was possible. The skylark, whose ascending flight had been prophetically hymned by Vaughan Williams early in 1914, was a powerful natural symbol of the war. The bird and its cascading, energetic trilling stood for escape, for the fields of home. It turned eyes upwards. Ted Wilson, a 29-year-old teacher, wrote to his mother about a scene near a trench: ‘Piled earth with groundsel and great flaming dandelions, and chickweed, and pimpernels, running riot over it… and over everything the larks’. Sergeant John Streets heard a lark and wrote that suddenly: ‘My soul rushed singing to the ether sky’. He was killed in the trenches in 1916. Isaac Rosenberg had a brief moment of joy in 1918: ‘Heights of night ringing with unseen larks: / Music showering on our upturned listening faces’. From the air at night could come death or song, Rosenberg remarked in his poem Returning, We Hear the Larks. The potency of the nightingale’s song to provoke feelings of nostalgia, belonging and delight kept radio listeners spellbound for the next 11 years: until 1935, the BBC continued to broadcast a nightingale in concert with Beatrice Harrison every May, often over several evenings. From 1936, continuing into the Second World War, the bird alone took the microphone for ten minutes between eleven and midnight, when the solace of birdsong was needed as much as ever. To conclude then, during the First World War and its aftermath, birdsong was a keynote of nature that brought emotional well-being to soldiers and civilians alike. Such feelings stemmed from the enchantment of witnessing the charm and durability of birdsong first-hand, its cultural presence in Romantic and war poetry, together with its evocations of a long-gone but precious pastoral English identity. After the conflict, the BBC’s live annual broadcasts of the nightingale’s song to the nation became a revitalizing counterpoint to the noise and chaos of the modern world. For John Reith, these broadcasts helped to shape the idea of public service radio as an instrument of national uplift and enlightenment. Michael Guida is a PhD researcher in Media and Cultural Studies at the University of Sussex, UK, where he is exploring how the sounds, rhythms and quietude of nature have been used to afford psychological welfare in Britain, especially in relation to war, during 1914-1945 period. John Reith, Broadcast Over Britain (London: Hodder and Stoughton, 1924), p. 221. Patricia Cleveland-Peck, The Cello and the Nightingales. An Autobiography of Beatrice Harrison (London: John Murray, 1985), p. 133. Richard Fitter, London’s Birds (London: Collins, 1949), p. 134. Richard Mabey, Whistling in the Dark. In Pursuit of the Nightingale (London: Sinclair-Stevenson, 1993), p. 99. Royal College of Music, London, Harrison Sisters’ Collection, box 224. Dan McKenzie, City of Din: A Tirade Against Noise (London: Adlard & Son, 1916), p. 25. Edwin L Ash, Nerves and the Nervous, revised edition (London: Mills & Boon, 1921), p. 21. Edwin L Ash, The Problem of Nervous Breakdown (New York: Macmillan, 1920), p. 188-209. Paddy Scannell and David Cardiff, A Social History of Broadcasting (Oxford: Blackwell, 1991), p. 29. From the Radio Times, quoted in Adrian Gregory, The Silence of Memory. Armistice Day 1919-1946 (Oxford: Berg, 1994), p. 135. Richard Fitter, London’s Natural History (London: Collins, 1945), p. 228-230. Richard Mabey, A Brush with Nature (London: Random House, 2010). Simon Armitage and Tim Dee, The Poetry of Birds (London: Penguin, 2011), p. 147. David Hendy, The Great War and British Broadcasting: Emotional Life in the Creation of the BBC. New Formations 2014 82: 85. Ian McIntyre, The Expense of Glory. A Life of John Reith (London: HarperCollins, 1994), p. 112. Richard Overy, The Morbid Age. Britain Between the Wars (London: Allen Lane, 2009). Mark Cocker and Richard Mabey, Birds Britannica (London: Chatto & Windus, 2005), p. 342. Alun Howkins, The Discovery of Rural England, in Colls R and Dodd P (eds) Englishness: Politics and Culture 1880-1920 (London: Bloomsbury, 2014), p. 105. Judy Giles and Tim Middleton, Writing Englishness: An Introductory Sourcebook (London: Routledge, 1995), p. 101.